On November 13, the Museum of the City of New York will unveil The Tiffany & Co. Foundation Gallery. Its design and construction were made possible through a grant from The Tiffany & Co. Foundation. The Foundation’s Excellence in Design program supports organizations that are enhancing the field of the decorative arts. The Tiffany & Co. Foundation Gallery and the installation of its inaugural exhibition Gilded New York, are designed by New York-based William T. Georgis Architects. The jewel-box gallery located on the City Museum’s third floor will feature newly constructed, state-of-the-art display cases that evoke a Gilded Age domestic interior finished with herringbone wood flooring, decorative wallpaper, mirrored window shutters, draperies, as well as a historic chandelier and fireplace mantel from the Museum’s collections. An elegant space, The Tiffany & Co. Foundation Gallery beautifully complements the Museum’s Georgian Revival design. Fashionable outfits and accessories were a highly visible marker of wealth as changing styles demanded frequent and vast expenditures of funds to stay abreast of current trends. 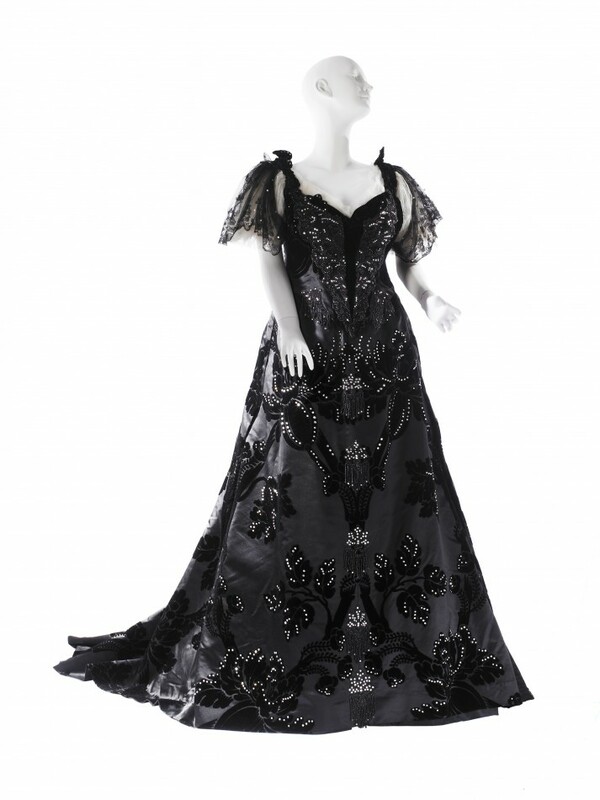 Paris couturier Charles Frederick Worth, whose “Electric Light” fancy dress gown was worn by Mrs. Cornelius Vanderbilt II to the Vanderbilt Ball, was in great demand among New York’s leading families. Worth’s stunning scarlet silk damask evening dress in chrysanthemum pattern, also showcased in the exhibition, is another example of the trend towards a glamorous look. Meanwhile, Manhattan shops provided a wealth of Parisian-inspired goods, including extraordinary ostrich, and eagle feather fans; a cigarette case adorned with sapphires; and a gold-and-diamond card case, which were the mainstays of an upper-class lady’s public costume and will be included in the exhibition. With the advent of what became known as “Ladies’ Mile,” fashion-conscious elite and middle class women were drawn to an expanse of densely packed department stores in Manhattan, delimited by 14th Street and 23rd Street on the north and south axis, and between Broadway and Sixth Avenue along the east and west. This well-lit shopping district enabled women to walk on the street unaccompanied by chaperones, where they could study and purchase the latest designs displayed behind modern, plate-glass windows. Complementing the increasing opulence in fashion, jewelry design reached new and dazzling heights during the Gilded Age. 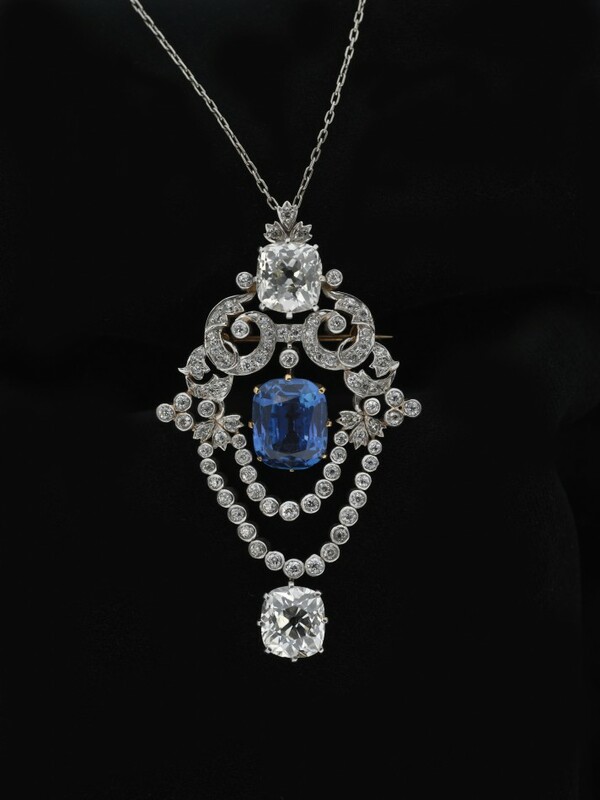 For decades, Americans on their European Grand Tours had purchased archeological-style jewelry popularized by designers like Italian Fortunato Pio Castellani and his son, Alessandro, but by the 1890s, they began to turn toward talented French jewelers like Cartier and others who exhibited at Paris’s international expositions. In New York City, the rise of Tiffany & Co., which sold splendid jewels such as the platinum, diamond, and seed pearl choker on view, helped to make the city an attractive and growing center for luxury jewelry. The fine craftsmanship of jewelers like Marcus & Co., evident in their multi-strand arts and crafts necklace composed of gold, demantoid garnets, natural pearls, and plique-à-jour enamel, contributed to this trend. Other New York jewelers whose work will be seen include those by the firm of Theodore B. Starr as well as Dreicer & Co., whose brilliant platinum, pearl, and diamond necklace is also on display. Ingalls Photography, 2012. All objects from the Museum of the City of New York. 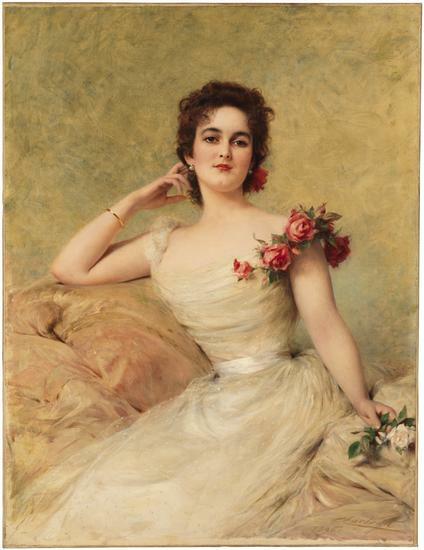 Wealthy New Yorkers traveled to Europe and returned with luxurious mementos that attested to their experiences abroad. Some of the items they collected were modern reinterpretations of ancient techniques, Italy being a major source of these purchases. They shipped quantities of Venetian glass—such as those in the exhibition—including drinking glasses, wine goblets and glass blown decanters. Women adorned themselves with archeological-style jewelry, popular since the 1850s, which included gold earrings and bracelets with depictions of landscapes, doves, and other subjects depicted in micromosaic settings, also on display. 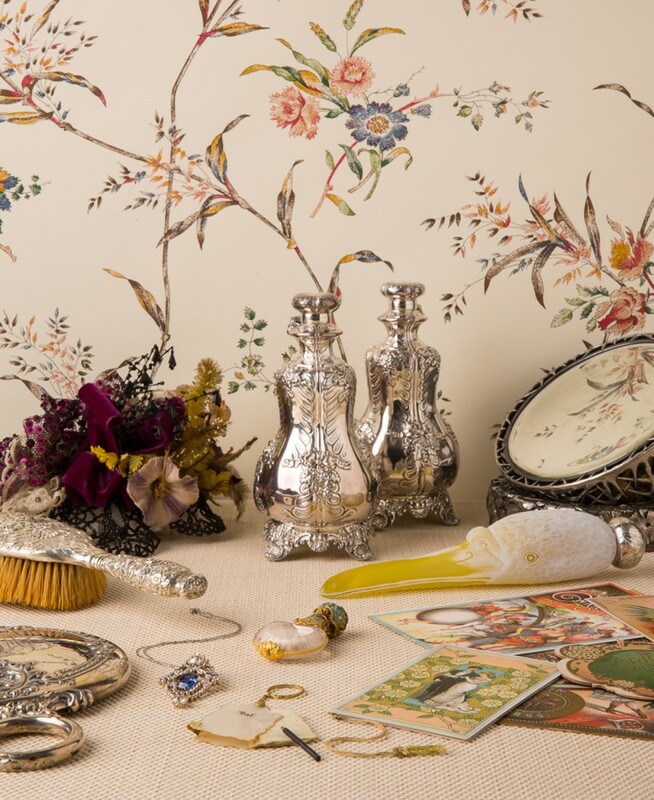 Whether bought at home or abroad, decorative objects in silver and gold were key attributes of a well-appointed life. Large and elaborate flatware services included specialized forms designed for culinary delights ranging from oysters to ice cream. Some services reached astonishing sizes, as in the case of a silver-gilt set ordered by William K. Vanderbilt from Tiffany & Co. that numbered more than 900 pieces, and from which a five-piece place setting will be on view. Silver presentation pieces marking important sporting and civic events such as yacht races – as in the handsome 1889 Goelet Prize for Sloops that is adorned with seaweed-draped mermaids – grew in size and grandeur as the century progressed. Silver and gold were also the preferred materials for personal gifts as in the case of the vessel and salver (or stand) designed by Crichton Brothers of London and New York as a golden anniversary gift from J. P. Morgan to the parents of Joseph Hodges Choate, New York lawyer and Ambassador to the Court of Saint James. 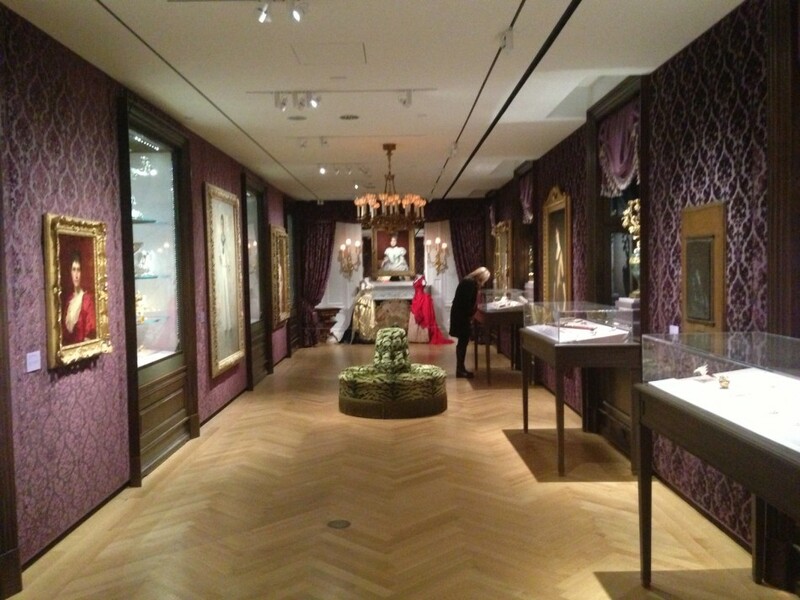 Stylish interiors also included fine furniture by Herter Brothers such as inlaid and gilded side chairs and jewelry cabinets such as those in this exhibition. New York area ceramics manufacturers also developed artistic wares that could rival those of Europe. And indeed, many of these manufacturers displayed their artistic wares at international fairs as well as in New York at luxury shops. 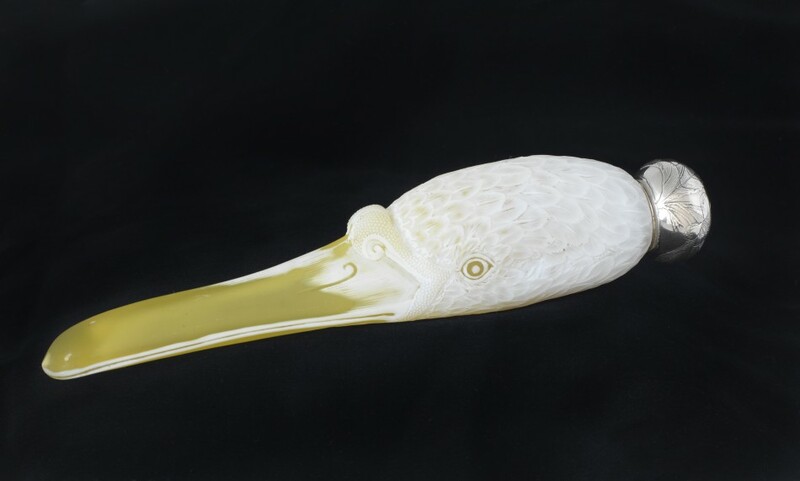 Luxury tableware in porcelain included such items as oyster plates then growing in popularity, and seen in the exhibition. Some firms benefitted from the talents of foreign-born decorators like Edward Lycett, who in his designs for the Faience Manufacturing Company of Greenpoint, Brooklyn, imparted a richly colored and patterned style based on the exotic shapes and colors of the Near and Far East. During this time, New York and the United States also achieved a level of sophistication in painting and sculpture that elicited comparisons to the European Renaissance and was therefore frequently characterized as the “American Renaissance.” This is evident from painted portraits of society figure Eleanor Iselin Kane (Mrs. DeLancey Astor Kane) and her son DeLancey Iselin Kane, both by Thomas Dewing, and the bronze bust of New York financier August Belmont by John Quincy Adams Ward. Turn-of-the-century New York was marked by the sudden rise of industrial and corporate wealth, amassed by such titans and their socially ambitious wives as Alva and William Kissam Vanderbilt and Caroline and William Backhouse Astor Jr. who were eager to display their wealth and express their high status through extravagant fashions, exquisite jewelry, and no-cost-spared art and design showcased at lavish balls and other social events. Originally these parties had been limited to existing members of the old guard, but as “new money” infiltrated the city, confusion arose over who was “in” and who was “out.” The excessive quality of these functions is evident in the photograph titled “Billings Horseback Dinner at Sherry’s, 1903,” where New York’s prominent gentlemen are having dinner at a restaurant while remaining on horseback. Wealth was also displayed by the grand residences along Fifth Avenue as well as the high-end shops where women went shopping along known as “Ladies’ Mile. Photographs of these glamorous social events as well as the extraordinary residences and interiors of the era will be displayed on digital monitors outside the Tiffany & Co. Foundation Gallery. 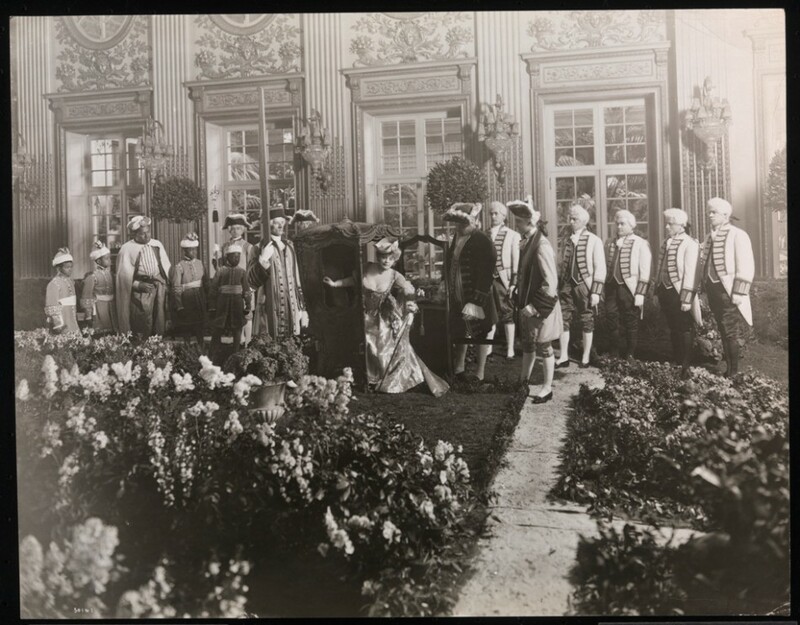 Madame Rejane (Gabrielle Charlotte Reju) seated, posed with others in the “Garden of Versailles” at the James Hazen Hyde Ball, January 31, 1905. All of these achievements contributed to the city’s coming of age. For the first time, New Yorkers consciously asserted themselves as international tastemakers and their city as a world capital, endowed with an ambition that has made—and remade—the city ever since. Gilded New York is organized by Donald Albrecht, the City Museum’s Curator of Architecture and Design; Jeannine Falino, an independent curator; and Phyllis Magidson, the City Museum’s Curator of Costumes and Textiles. The accompanying book Gilded New York is edited by Donald Albrecht and Jeannine Falino, with essays by them, as well as Phyllis Magidson, Susan Gail Johnson, and Thomas Mellins. It is co-published with The Monacelli Press. Since its inception in 1837, Tiffany & Co. has been guided by the belief that a successful company has a responsibility to the greater community. The Tiffany & Co. Foundation was established in 2000 to focus the company’s philanthropic endeavors. Please visit http://www.tiffanyandcofoundation.org to learn more about The Tiffany & Co. Foundation’s work. Founded in 1923 as a private, nonprofit corporation, the Museum of the City of New York celebrates and interprets the city, educating the public about its distinctive character, especially its heritage of diversity, opportunity, and perpetual transformation. The Museum connects the past, present, and future of New York City, and serves the people of the city as well as visitors from around the world through exhibitions, school and public programs, publications, and collections. Visit http://www.mcny.org to learn more. Thank you, Evangeline! This is now on my wish list for this coming year (to visit the exhibit). And the book is also on my wish list. This was such a glorious time for New York City. One of my favorite places in the world to visit. I would never have known about the Museum having this going on if I had not seen your post, so thank you! Hopefully I too will get a chance to see this in person before it closes!